When the world heard back in 2001 that Shigeru Miyamoto, the one responsible for creating Super Mario Brothers & The Legend of Zelda, had created a new type game. The world was eager to see what it was all about. After 2 games & nearly a decade since its last release: Pikmin 3 has arrived for the Wii U. Its surreal design mixed with real time strategy evoked a new sensation & as space explorers, we were invited to an unknown planet with its inhabitants & from the moment that we first encountered the Pikmin – we all fell in love. So after taking so long to develop, have the leaves on the Pikmin bloomed or have they gone in the wind? In a galaxy very far away, due to a lack of planning & over population, there exists a civilization on a planet called Kopai – whose inhabitants have exhausted their food supply. To resolve this situation, they send unmanned scout vessels in space to search of edible matter on other planets. One vessel comes back with positive reports and as their last hope; they send 3 galactic explorers to investigate the planet identified as PNF – 404. As they approach the planet, the team is separated & it’s up to you to get them back together before dying of starvation. You play as Captain Charlie, Brittany the botanist & Alph the engineer. You begin off with one of the explorers and as you search for your companions you meet a group of flower like creatures named Pikmin, who work in unison to overcome obstacles in the same manner as ants. 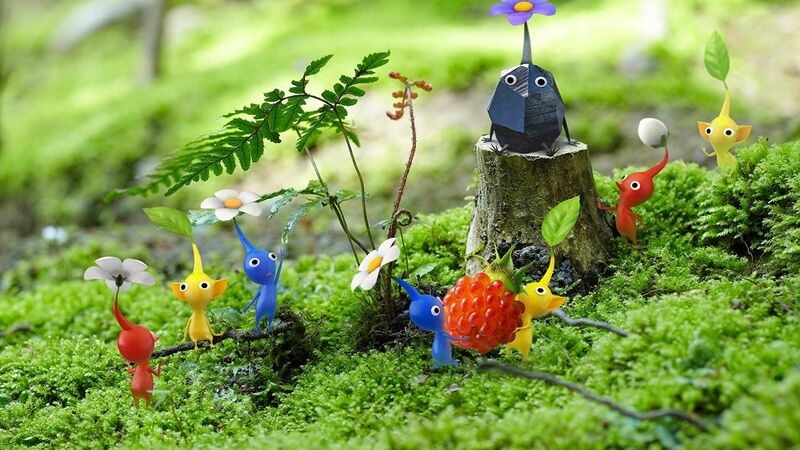 The Pikmin (ピクミン) are colorful planet-animal hybrids that inhabit the mysterious alien planet. Your primary objective is to search for fruit, which is essential for the inhabitants of Kopai because it’s all they consume. Every day begins at dawn. Each level is designed, as a day with a limited time of 15 minutes to scavenge for resources that will help you on your journey but ultimately finding fruit will help you survive longer as you explore the planet. Every fruit that you bring back is worth around 1 – 3 jars full of condiments. After each day, you consume 1 bottle of food. So if you find 3 jars worth of food you’ll end up with 2. If you run out of food, the game is over. You must take advantage of time without those 15 minutes. The nocturnal life is inhospitable so sometimes you’ll find yourself trying to complete a task only to have to leave in the middle in order to get off the planets surface. March along vast landscapes of different seasons with the trusty Pikmin by your side. Planification is essential & if you haven’t done so you might end up leaving a few Pikmin left behind to be consumed for midnight snacks. After the 15 minutes, the day ends & the statistics of your hard days work will be displayed. You’re able to replay your movements throughout the day & can go back to previous days but that will reset all other days already played. This is an interesting but simple time mechanic that functions well. The only down side is the 1 save file. Pikmin live in a colorful flying nest called the Onion & you’re only able to take out 100 at time. Each Pikmin are unique. 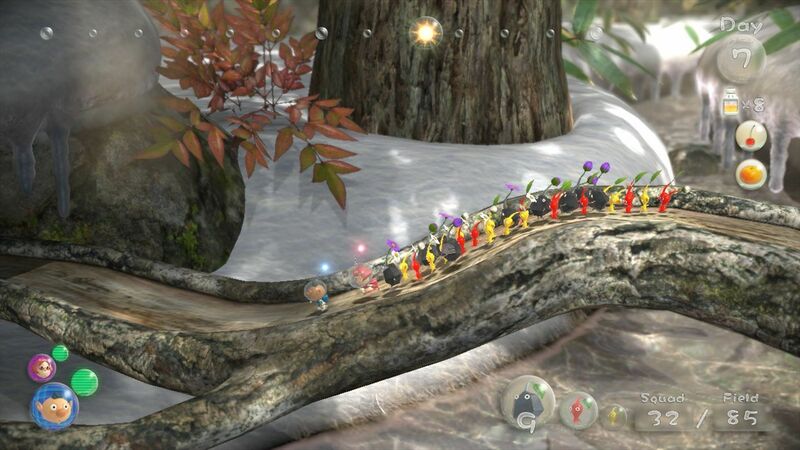 The returning Pikmin are the Red ones that are resistant to fire & are better fighters. Blue can swim, Yellow are resistant to electricity & are able to act as conductors. The new Winged type are pink and attack in the air while the new Rock type can smash heavy objects and cannot be flattened. You’ll learn more about them & on how to manage your squad later in the game. 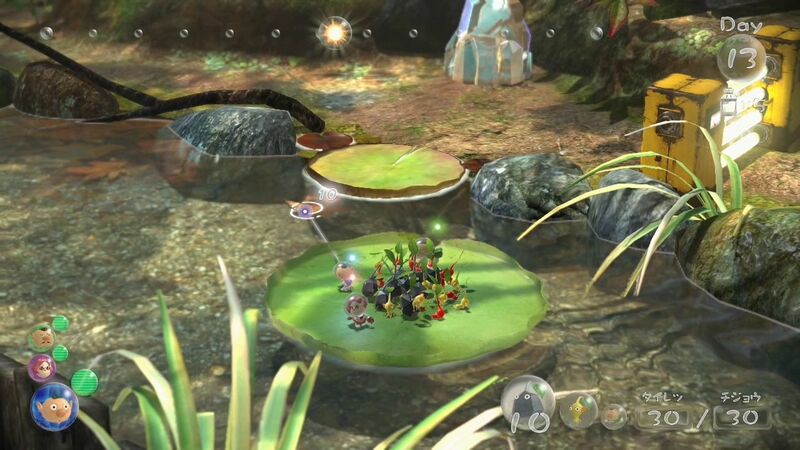 The gamepads role in Pikmin is in the form of the KoPad. An electronic device you will constantly be using to pause the game to analyze your environment and plan ahead for attacks or what you’re going to do throughout the day. Its functionalities range from locating fruits, showing Pikmin & the level map. It’s also the HUB for information regarding controls, abilities, details on enemies & so on. It’s a lovely mechanism that provides more immersion for the player. There is a camera that you’re able to use & take pictures but this feature doesn’t offer much usage. 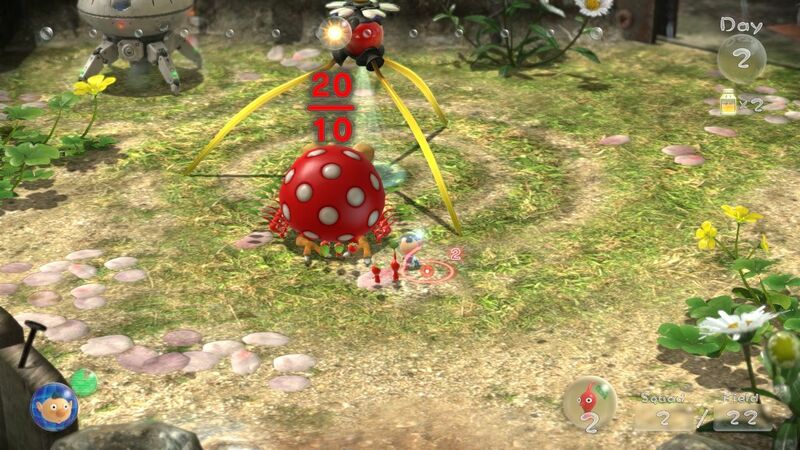 Pikmin 3 is all about discovery and you’re rewarded for doing so. As you explore, problem solving will become more apparent. Using your colleagues to get above a ledge, balancing weight & opening new paths are just a few things that you’ll come across. Using the game pad to pause the movement of your surroundings helps plan out your next move. You can also switch between all 3 captains individually and each can carry on a specific task to take advantage of time. Depending on how well your time management skills are, the game could be completed in more than 40 or less than 10 in-game days. There’s so much to do and so little time in a day. You’ve been there many times before so you know it’s best to prepare in advance! There’s no denying it’s a beautiful game… because it is. The environment & vegetation are gorgeous and bring life to this inviting atmosphere. You feel the seasons like fall, winter, and spring along with other variables that spark your attention such as the reflection of the sun, when it rains, the transparency and fluidity of the water, the way the textures are presented on the fruits & its always enjoyable watching the shuttle burst through the stratosphere. Engaging in combat with predators is entertaining and can be sometimes frustrating with the camera angle and movement. The creatures are surreal & all are unique.. just like with every world within Nintendo, they blend into their surroundings and provide a challenge. When encountered with an enemy.. It’s rewarding to defeat them and especially more satisfying for the bigger beasts. Some drop spoils or other real world objects. Every creature has its way of being killed. It’s a different twist to the genre based on the animal kingdom, your Pikmin will be eaten more than once & that’s nature at its finest. 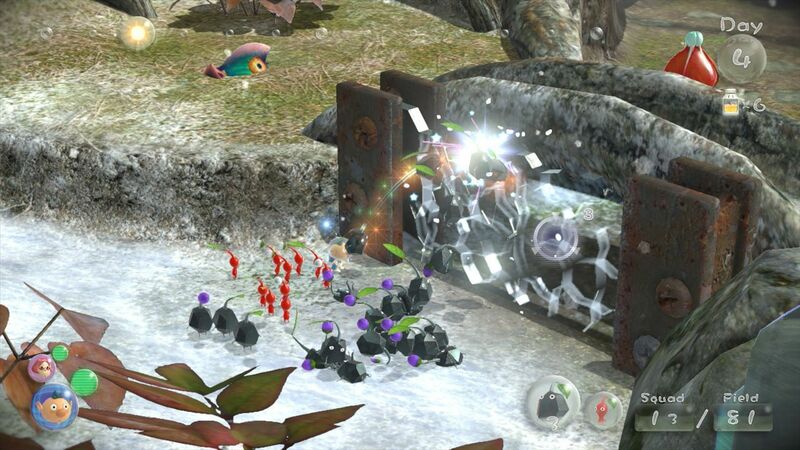 You feel the loss with each Pikmin & must learn to navigate the world around you by planning first to become more aware of your surroundings. It’s the right balance of realism with cartoonish characters to populate each area. Once the game is complete, you’re able to start a new game & try to beat your fastest time. Backtracking is there but hardly provides more content within the campaign. In multiplayer, up to 4 players can play Bingo Battle. In this mode you try to line up your scorecards by searching for the specific item to win. The negative is no online capabilities & having to deal with split-screen. In Missions, You can also play solo or with a friend to find treasures, defeating enemies or replaying Boss’s battles again under time limits. The White & Purple Pikmin return but only for these selections. People argue that the camera ruins the gameplay and direction of movement in the levels & its true but it’s not that irritable to use the Wii Remote & Nun chuck like some suggest. SO DON’T, You’ll miss out on the whole point in using the gamepad to enhance the experience. Whether its through their in game diaries, the dialogues they share or the way they name the fruits– it’s always memorable to see the three protagonists interact but ultimately its the coexistence of everything make it another Nintendo game that will put a smile on your face. There’s nothing as refreshing as Pikmin & if you’re a Wii U owner, it’s an addition you’ll want to add to your library. It’s an abstract and fascinating universe with only 3 games in existence up to this day. It’s clearly the best one out of the 3 – and a step forward for the franchise. We can only hope that it doesn’t take another 9 years to come out with the next one. Every level that you visit offers visual gratification and wonder as you transverse into the unknown.